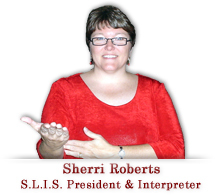 Sign Language Interpreting Services, LLC (SLIS) is owned and operated by Sherri Roberts. Sherri has been interpreting in the Bryan/College Station area of Central Texas for more than 20 years. Sherri Roberts is both state and nationally certified as an interpreter and transliterator for sign language users, and holds a masters degree in educational psychology with an emphasis on consultation. After working with people who are deaf and hard of hearing for many years, Sherri could not keep up with all the interpreting requests on her own. After much encouragement, Sherri started hiring co-workers that she knew to be qualified to work with her. SLIS has grown very rapidly because of our concern with customer service (read sample customer testimonials). SLIS now employs over 20 interpreters and contracts with another 15-20 as needed. With the growing population of students who are deaf at both Blinn College and Texas A&M, and the growing population of people who are deaf and hard of hearing in the Brazos Valley, SLIS stays busy! But not too busy to give our clients and customers the service they need. Allowing communication to happen is our motto. That only occurs when a qualified interpreter is available to assist with communication needs.